JEL classification: G01, G18, G21, G23. Central clearing is a key feature of global derivatives markets. Almost two thirds of over-the-counter (OTC) interest rate derivative contracts, as measured by outstanding notional amounts, are now cleared via central counterparties (CCPs) - up from around one fifth in 2009. 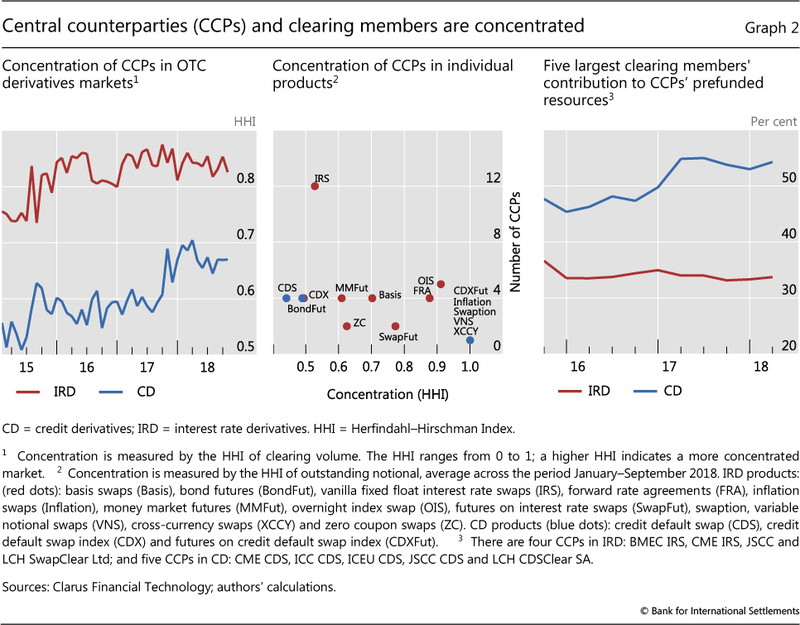 The share of central clearing has also grown in other product markets, such as credit derivatives. The increasing use of CCPs is by design. Notably, the G20 leaders agreed in 2009 that standardised OTC derivative transactions should be centrally cleared (G20 (2009)), in recognition of the risk management benefits offered by CCPs. Increased regulatory attention to CCPs' risk management has accompanied the G20 central clearing mandate. Global standards for the resilience and recovery of CCPs have been strengthened since the crisis (CPSS-IOSCO (2012), CPMI-IOSCO (2017a,b)), guidance has been set out for resolution planning (FSB (2014) and FSB (2017)) and a framework developed for supervisory stress testing of CCPs (CPMI-IOSCO (2018)). These standards buttress the systemic stability benefits of central clearing by strengthening the resilience of the CCPs themselves. But risks in cleared markets remain. 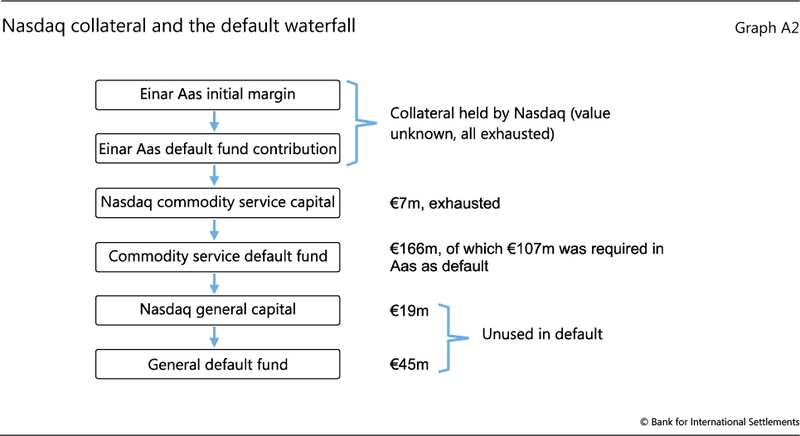 In September 2018, a single trader's default wiped out roughly two thirds of the commodities default fund at Nasdaq Clearing AB, a Swedish CCP (Box A). OTC derivatives markets are closely knit. Two recent reports by international standard setters (BCBS-CPMI-IOSCO-FSB (2017, 2018)) map the interlinkages between CCPs and clearing members, the most important of which tend to be systemically important banks. These interlinkages give rise to questions on interactions, as risks can be generated endogenously (Shin (2010)). For instance, how does risk management at CCPs affect banks' risk-taking? Conversely, how does banks' risk-taking behaviour affect CCP resilience? Could these interactions lead to a self-reinforcing feedback loop under stress? 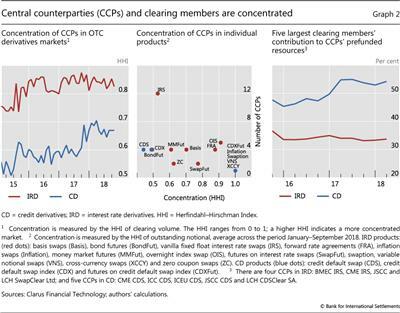 Central clearing is a highly concentrated business, in terms of both providers (ie central counterparties (CCPs)) and users (which are, primarily, systemically important banks). While central clearing has reduced risk in the financial system overall, banks and CCPs could interact in ways that, in some circumstances, might lead to a destabilising feedback loop, amplifying stress. Hence, the risks of banks and CCPs should be considered jointly, rather than in isolation. Our special feature is a step towards addressing these questions. 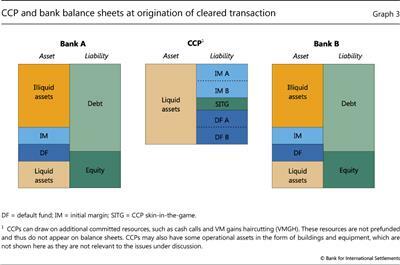 In describing how a typical CCP manages its risks, we outline the links between its balance sheet and those of its large clearing members ie systemically important banks (henceforth, "banks"). The "CCP-bank nexus" arises as CCPs' risk management and banks' risk-taking interact with one another. We show how, under stress, the nexus could lead to a potentially destabilising feedback loop. The channels for this loop would vary with the level of market stress. The nexus underscores the potentially endogenous nature of bank and CCP risks, and highlights the need to consider these risks jointly, rather than in isolation. This insight could be useful for future policy work on reducing financial stability risks in OTC derivatives markets. Admittedly, the analysis in its current form has limitations. We abstract from certain institutional features of derivatives markets. Some of these, such as member ownership of CCPs or member banks' credit lines to CCPs, might affect the interactions outlined in this feature. Hence, it is difficult to draw direct policy inferences from the analysis. In particular, the special feature should not be seen as implicitly evaluating the post-crisis regulatory reforms. Lastly, as this feature focuses exclusively on risks related to central clearing in OTC derivatives, it should not be used to assess the relative merits of central and bilateral clearing. The rest of this special feature is organised as follows. We first report stylised facts about OTC derivatives markets and the main players in these markets: namely systemically important banks and CCPs. In the second section, we outline how CCP risk management and bank risk-taking interact, ie the CCP-bank nexus. 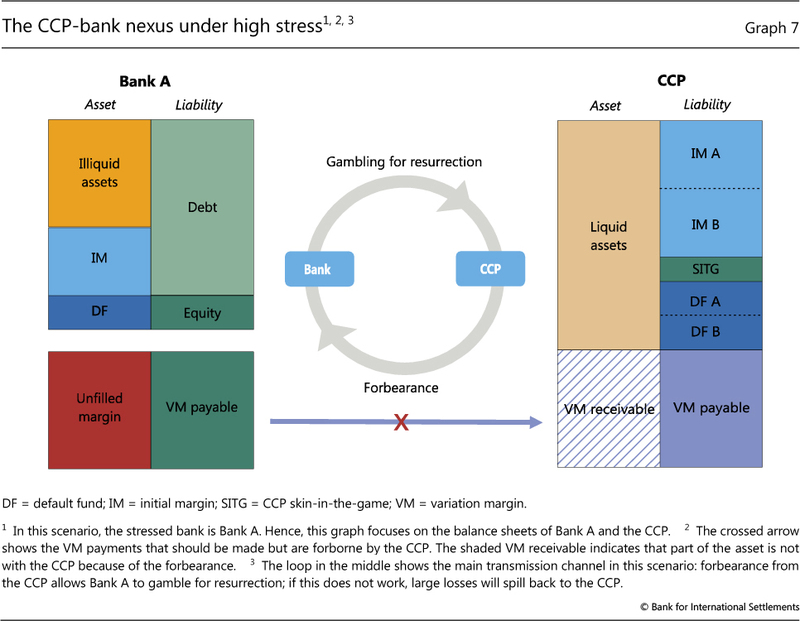 In the third section, we examine three scenarios that illustrate how stress transmission channels work in the CCP-bank nexus. The final section concludes. Central counterparties have been described as "unlikely heroes" for their handling of the Lehman Brothers' default (Norman (2011)). CCPs proved resilient during the crisis, continuing to clear contracts even when bilateral markets dried up (Domanski et al (2015)). Lehman had derivative portfolios at a number of CCPs across the world and, with one exception, these were auctioned, liquidated or transferred within weeks of the default without exhausting the collateral Lehman had provided (Cunliffe (2018), Monnet (2010)). One example is the unwinding of Lehman's interest rate swaps portfolio cleared in London (66,390 trades, $9 trillion notional), which used up about a third of the margin held, so that neither the CCP nor its members sustained any losses. Yet 10 years later, a single trader with a much smaller portfolio presented a CCP with a much greater challenge. That tribulation came on 10 September 2018, when Einar Aas, a Norwegian trader, failed to pay a margin call to the commodities arm of Nasdaq Clearing AB in Sweden. 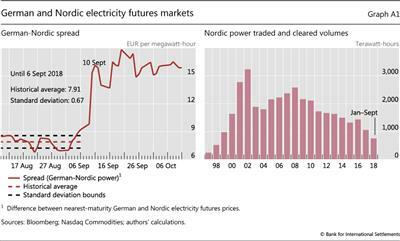 Aas had bet that Nordic and German electricity prices would converge, by trading in futures on the Norwegian commodity derivatives exchange, Nasdaq Oslo ASA, which clears all trades with the Swedish CCP. Weather forecasts and a change in German carbon emission policies pushed the two prices apart, driving the value of Aas's position down sharply (Graph A1, left-hand panel). Correlation strategies of this kind were once described, in the case of Long-Term Capital Management, as "picking up nickels in front of a steamroller" (Lowenstein (2000)). When Nasdaq made a margin call that Aas failed to pay in full, he was put into default the next morning. The CCP sought to manage the default by selling the position. In the following days, an auction was held for Aas's portfolio with four of Nasdaq's other members. The winning bid resulted in a loss of €114 million in excess of the collateral Aas had provided. 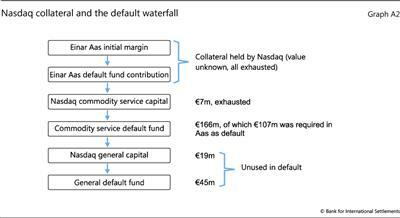 For commodities, Nasdaq's "default waterfall" (once Aas's collateral was exhausted) started with capital of €7 million, after which it tapped a €166 million fund made up of contributions from the non-defaulting members (Nasdaq has three services, each with a separate default fund). In the event, this sufficed to absorb the loss resulting from Aas's default. In addition to the funds consumed, another layer of capital was available, as well as a general default fund covering all Nasdaq Clearing's services (Graph A2). For a CCP to exhaust a defaulter's collateral is unusual, even in the case of a large default such as Lehman's. CPMI-IOSCO (2017b) contains guidance on how CCPs should set their margin to prevent this from happening. The guidance includes calculating initial margins using a sufficiently long time horizon, using assumptions on how liquid the market is, and allowing only for prudent offsets between products. Although there is currently no public record of how much collateral Aas provided, Nasdaq has publicly disclosed how it calculated his initial margins. For his Nordic and German futures positions, Nasdaq required Aas to pay 99.2% of the biggest two-day market movements over the previous year, plus 25% of the biggest two-day movement that year. But the CCP also gave him a correlation offset of 50% on the margin, assuming that German and Nordic electricity prices would continue to move in parallel. 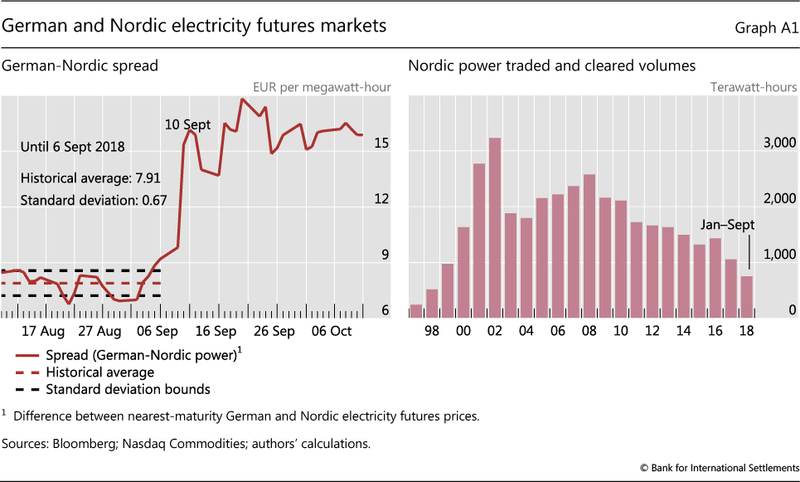 Moreover, Aas was not required to pay any additional margin, even though the position made up a large proportion of the Nordic power market - a market that had been shrinking significantly in volume over the past decade (Graph A1, right-hand panel). This was despite the fact that liquidation costs are generally high for portfolios which are large relative to the available market. The reasons for this are unclear, but some observers have suggested that margin-setting may sometimes reflect competitive pressures (Domanski et al (2015)). How then was Lehman's default handled without losses in hard times, while Aas's default forced a CCP to pass losses to members? Lehman's portfolio, while large and complex, was relatively balanced and part of an even larger market. Although it was in supposedly more complex over-the-counter (OTC) derivatives, CCPs had adequate strategies and collateral in place. This was in stark contrast to Aas's portfolio, which was undiversified and heavily concentrated in a smaller and less liquid market. These episodes underscore the importance of maintaining sufficient market liquidity for central clearing to support default management in stressed conditions, and of applying a reliable long-term perspective in order to set accurate margins (Cunliffe (2018)). So, although Lehman's portfolio was much larger, CCP default management teams could hedge and reduce risks, allowing orderly auctions to take place over a number of weeks following the default. These two defaults happened 10 years apart, under very different circumstances. Yet the lesson is timeless: sound risk management and preparation make all the difference between a CCP that absorbs a shock, and one that propagates it. OTC derivatives clearing is characterised by (i) large exposures between banks and CCPs; (ii) a small number of CCPs; and (iii) a small number of banks (BCBS-CPMI-IOSCO-FSB (2017, 2018)). 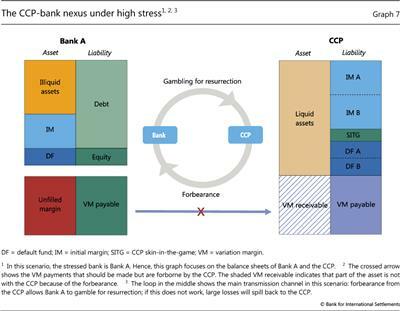 Together, these features underpin the CCP-bank nexus. On the back of post-crisis policy initiatives, both the share of centrally cleared OTC derivatives contracts and the exposures between banks and CCPs have increased substantially.2 Estimates based on the BIS derivatives statistics indicate that the central clearing rate has risen from around 20% in 2010 to at least 60% in 2017 for interest rate derivatives (IRD) (Graph 1, left-hand panel, red dashed line) and from roughly 10% to around 40% for credit default swaps (CDS) (blue dashed line).3 As a result, CCPs clear large notional values of IRD and CDS contracts (Graph 1, centre panel). Currently, these stand at 4.4 times world GDP, up from 2.8 times in 2008. The exposures of individual banks are also large, eg the notional amount of JPMorgan's OTC derivatives exposures to CCPs is about $30 trillion (Graph 1, right-hand panel). Netting efficiency is one of the drivers of CCP concentration. Duffie and Zhu (2011) show that CCPs can reduce the aggregate amount of margin by enabling multilateral netting across different counterparties. Thus, the fewer the CCPs through which banks clear their derivatives transactions, the lower the associated collateral and capital requirements. A handful of systemically important banks typically comprise the main clearing members. The top five clearing member banks contribute around one half of prefunded resources for credit derivatives and more than one third for interest rate derivatives (Graph 2, right-hand panel). A key driver of this concentration is large fixed costs: members need to meet not only CCPs' membership requirements, but also maintain technical infrastructure, contribute to the default fund and have the capacity to monitor CCPs carefully. 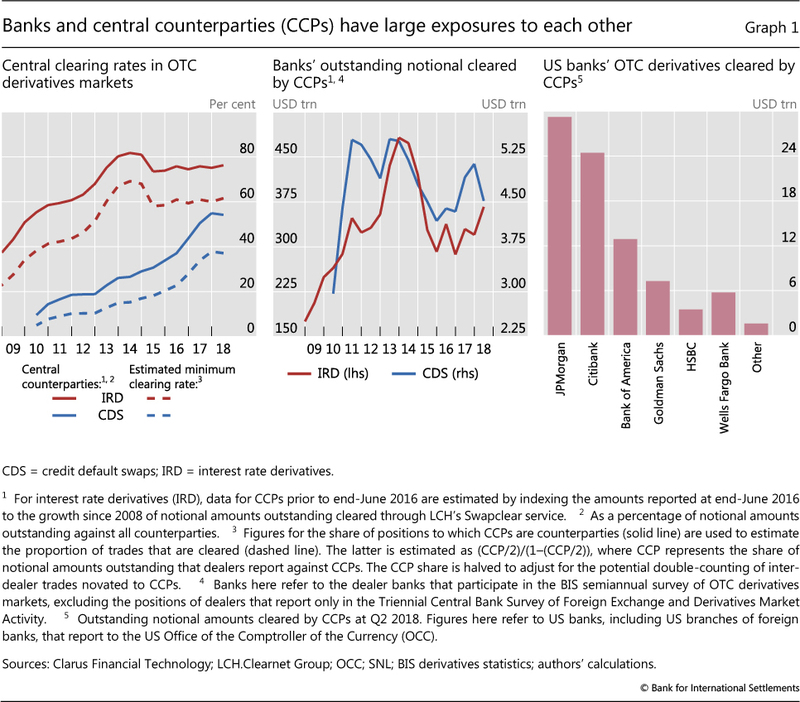 In sum, global OTC derivatives clearing is highly concentrated across both banks and CCPs, so that the behaviour of banks and CCPs is closely intertwined. Derivatives transactions may hedge but they also generate risks. Specifically, they expose users to market risk, liquidity risk, and counterparty credit risk. The key function of a CCP that clears a derivative transaction between two banks is to manage the counterparty credit risk. Second, while initially the cleared transaction has zero market value, it has already left a footprint on the balance sheets of the banks and the CCP. Specifically, the CCP requires both banks to post initial margins (IM) for the transaction. The IM - which is a liability for the CCP and an asset for the banks - also adds to the CCP's loss-absorbing capacity. In a hypothetical scenario without any market shocks, the CCP simply repays the IM at the maturity of the transaction. Graph 3 underscores a key difference between CCP and bank balance sheets. Illiquid assets (eg loans) are a hallmark of the banking model and take up a substantial part of banks' balance sheets. By contrast, CCPs hold exclusively liquid assets. Market movements affect the price of the derivative, triggering balance sheet adjustments (Graph 4). The bank that has incurred a mark-to-market loss - Bank A in our example - recognises this loss by posting variation margin (VM) with the CCP. In the process, this bank draws down its liquid assets, writing off the same amount of capital on the liability side. 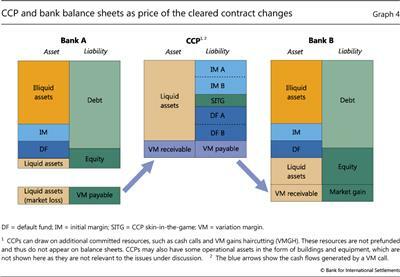 In parallel, Bank B receives VM from the CCP and its balance sheet changes symmetrically to that of Bank A. The exchange of VM through the CCP typically takes place daily and prevents the build-up of exposures. Hence, a CCP always has a matched book (see Cecchetti et al (2009), Pirrong (2011)). In the current context, counterparty credit risk is the risk that a bank does not meet a margin call, ie defaults on its payment obligation to the CCP.6 When this happens, the CCP still needs to make a payment to the surviving bank. To mitigate this risk, the CCP will aim to fulfil its part of the transaction with the minimum possible loss. The resources on which the CCP can draw will depend on the size of the default loss, as illustrated in the so-called default waterfall (see Domanski et al (2015)) (Graph 5). Some layers of the default waterfall are not specific to central clearing while others are. In the event of a clearing member's default, a CCP first absorbs losses by drawing on the IM that the defaulter has posted. This is similar to how a counterparty's margin would be used to cover losses in a non-cleared transaction. If the defaulter's IM is insufficient, the CCP has access to resources that would not have been available in a bilateral trade, starting with the defaulting member's contribution to the DF. The next layer in the waterfall is typically the CCP's own capital, often referred to as "skin in the game" (SITG). But CCPs differ from banks, in that they can continue as going concerns even after exhausting their SITG: they have other resources, sometimes even more junior, to absorb credit losses. For one, the CCP can draw on the DF contributions of all non-defaulting clearing members, not only the one(s) that had initially transacted with the defaulting member(s). It is in this sense that clearing members cross-insure through a mutualised DF. If this does not suffice, the CCP can resort to members' unfunded commitments. It can ask for supplemental funds from surviving members (cash calls) or retain (part of) their variation margin gains (variation margin gains haircutting (VMGH)). In other words, the CCP has loss-absorbing capacity that goes beyond its balance sheet: the CCP itself would not fail as long as the loss mutualisation process continues to work. 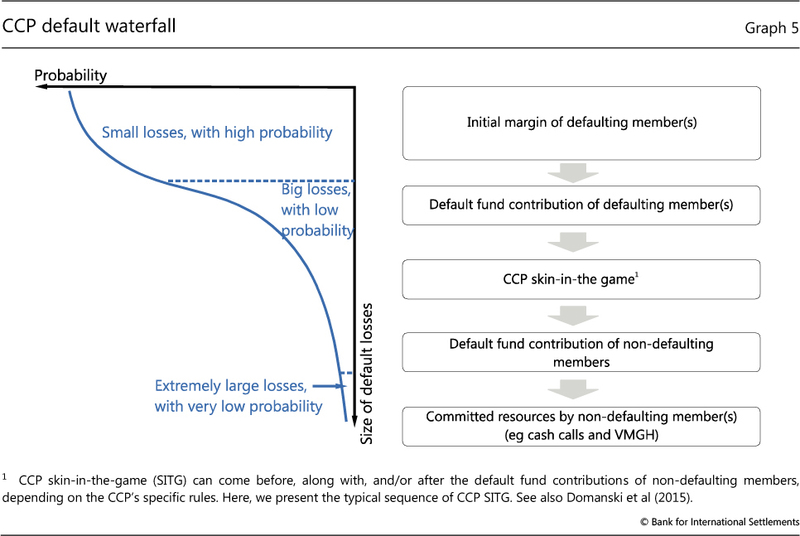 CCPs manage counterparty credit risk through the different layers of the default waterfall. Banks take into account CCPs' rules in their risk-taking behaviour. Both activities influence each other. A CCP seeks to ensure that the prefunded resources posted by clearing members (ie IM and DF) are sufficient to cover even extreme losses with high certainty. The IM is set to cover the potential changes in the value of a trade. To this end, the CCP sets IM based on three key parameters: (i) the likelihood of large fluctuations in the price of the underlying asset; (ii) the expected time needed to close the position at fair price; and (iii) the desired confidence level for the loss at default.7 The CCP sets the size of the mutualised DF so that it can cover default(s) of the largest clearing member(s) at the CCP.8 Typically, the DF requirements are adjusted less frequently than margins. The behaviour of banks influences that of CCPs and vice versa. On the one hand, banks' risk-taking affects how IM and DF are determined. For instance, a CCP will require a high IM for a bank with a very concentrated position because it would expect to close the position over a long time period and with a large price impact. On the other hand, contributing to the CCP's default waterfall imposes costs on banks. For instance, the size of IM affects the cost of derivative trading (see eg Pirrong (2013), Murphy et al (2014)). These costs can affect banks' risk-taking. The default waterfall structure further complicates these interactions, as the size of the losses determines which layers come into play. Hence, the level of market stress affects the interactions between CCPs and banks. 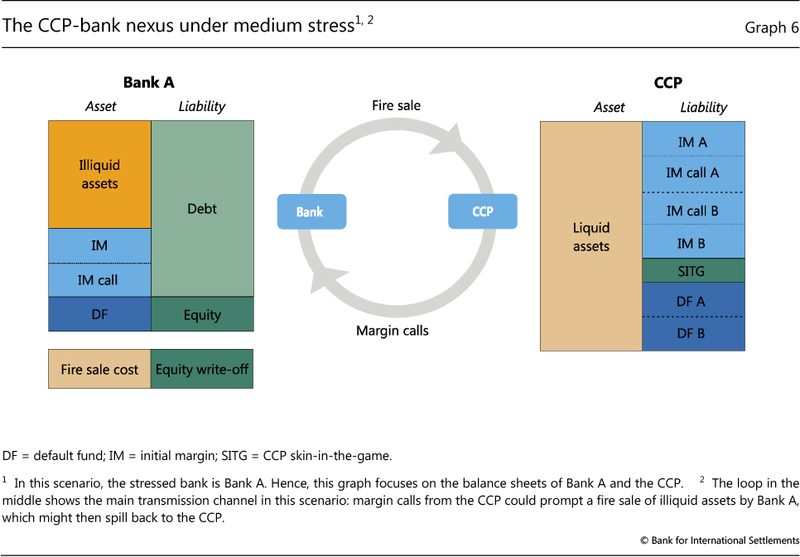 Drawing on historical examples of CCPs for exchange-traded derivatives, this section illustrates the CCP-bank nexus using three stress scenarios that differ in terms of the affected layers of CCP loss-absorbing capacity.9 The first scenario refers to a medium level of stress, where only the IM is at risk (Graph 5 left-hand panel). 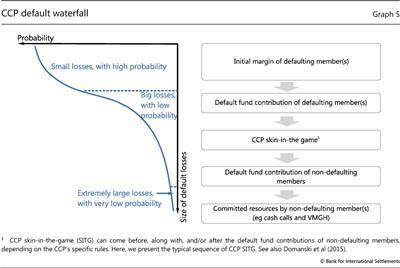 Higher stress in the second scenario puts at risk further layers of the default waterfall, including the SITG and the DF. The third scenario refers to an extreme level of stress, at which the CCP would turn to unfunded commitments, by calling on member banks. In the first scenario, the stress affects only the IM, as in the period following the United Kingdom's Brexit referendum vote in June 2016 (Box B). The increase in market volatility leads to liquidity strains. As volatility increases, a CCP issues IM calls, because the likelihood of further large fluctuations in the price of the underlying asset also rises (Graph 6, right-hand panel). In meeting IM calls at short notice, en masse, banks may face larger-than-normal haircuts on liquid assets (a "fire sale"), or may even need to tap into their illiquid assets (Graph 6, left-hand panel). A feedback loop could then arise, as the banks' fire sales might spill over into the derivatives markets, especially if banks sell precisely those assets that were stressed in the first place. The spillback could then exacerbate the very volatility that prompted the IM calls. The second scenario is based on the French Caisse de Liquidation des Affaires et Marchandises (CLAM) case in 1974 (Box C). A key characteristic of this scenario is that the CCP, fearing the depletion of its default fund, postpones margin collections from a stressed bank (ie forbears). The Brexit referendum led to large margin fluctuations on 24 June 2016. The outcome surprised markets, causing sharp swings in exchange and interest rates and thereby triggering large intraday margin calls for banks in the interest rate swap markets. The margin calls in the days following the referendum are estimated to have been around $27 billion, five times greater than the previous 12-month daily average. Publicly available data on the size of these margin calls for individual banks are limited. However, according to figures reported by US institutions, Morgan Stanley and Citigroup each received more than $1 billion in margin calls for their client clearing businesses, more than twice as much as normal (Graph B, left-hand panel). While the Brexit event moved markets, it did not cause widespread turmoil or problems in specific financial institutions. It did, nonetheless, lead to large margin calls and liquidity outflows for banks. Such margin calls, if they were to happen in a more volatile environment, could subject banks to substantial liquidity strain. 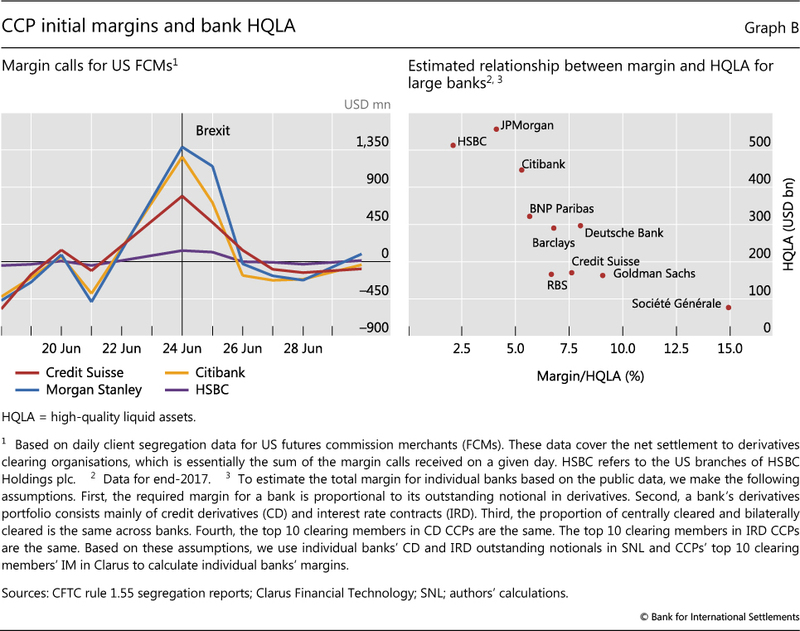 The reason is that margins represent a relatively large proportion of banks' total high-quality liquid assets (HQLA) (Graph B, right-hand panel). The estimated margins for individual G-SIBs range from 2.5 to 15% of HQLA. Under an adverse scenario, when liquidity is already likely to be under pressure from other sources and markets are experiencing fire sales, margin calls can represent a potentially serious source of liquidity risk. 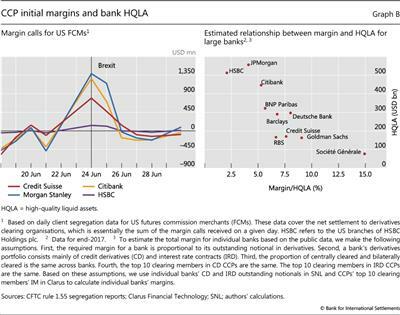 More reassuringly, however, larger institutions tend to have lower margin-to-HQLA ratios, which would tend to limit the systemic ramifications of increased margining. This amount covers margin calls by CME Clearing, ICE Clear Credit, ICE Clear Europe, ICE Clear U.S. and LCH Clearnet Ltd. See CFTC (2016). The CCP's forbearance allows the stressed bank to continue its usual business activities. On the one hand, the CCP acts countercyclically and could potentially avoid destabilising the financial system. On the other hand, banks that are close to failure are tempted to gamble for resurrection (eg Freixas et al (2004)).11 Therefore, the CCP's forbearance could interact with gambling-for-resurrection by the stressed bank, leading to even larger credit losses down the road. For instance, CLAM's forbearance enabled the stressed member to pile up even larger positions, which amplified its initial losses (see Bignon and Vuillemey (2017)). 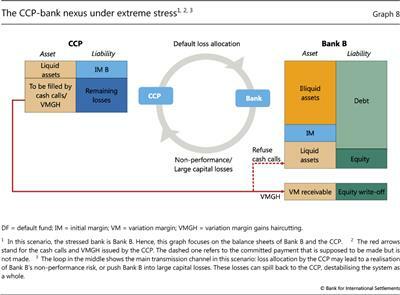 The third scenario stems from extreme market stress that forces the CCP to declare the default of one or more large clearing member banks. Furthermore, the CCP's default-related losses are so large that they exhaust the prefunded resources of the waterfall (IM and DF). The closest example of such a scenario is the failure of the Hong Kong Futures Guarantee Corporation in 1987 (Box C). CCP failures are few and far between. There have been only three such instances over the last 50 years: the French Caisse de Liquidation des Affaires et Marchandises in 1974, the Kuala Lumpur Commodity Clearing House in 1983, and the Hong Kong Futures Guarantee Corporation in 1987. These episodes have some elements in common. First, all three CCPs cleared long-dated derivatives contracts. Second, the weeks before the failure saw unusually high volatility in the underlying asset price. Third, unmet margin calls by the clearing members triggered the failure. There have also been a number of near-failures associated with periods of market stress (IMF (2010)). In the wake of the October 1987 equity market crash, both the Chicago Mercantile Exchange and the Options Clearing Corporation met with difficulties in receiving the required margin increases from their members. Brazil's BM&F CCP almost failed in 1999 after a devaluation of the Brazilian real caused two clearing members to default. In some cases, CCPs have come under stress in relatively benign market conditions. In December 2013, a Korean CCP dipped into its mutualised default fund after one of its members - a small broker-dealer - defaulted because of a trading error. The surviving clearing members absorbed more than $40 million in losses by replenishing the fund. The more recent case of Nasdaq Clearing AB is discussed in Box A. Together, these episodes highlight the fact that, while CCPs are designed for safety, they can fail. Preventing and managing these eventualities is the key motivation for the extensive work by regulators to put in place viable recovery and resolution plans (CPSS-IOSCO (2012), CPMI-IOSCO (2017), and FSB (2014, 2017)). Bignon and Vuillemey (2017) set out a detailed exposition of the events around the CLAM failure. In October 1987, the HKFGC defaulted and remained closed for four days, before being bailed out by the government with an injection of HK$ 1 billion. See the Davison Report (1988) for more details. In this scenario, surviving member banks are asked to cover any losses remaining after the prefunded resources have been exhausted (Graph 8, right-hand panel). There are two main tools available to the CCP in this setting (left-hand panel). First, the CCP can issue cash calls, asking all surviving members to cover the remaining losses. In such extreme stress, however, the prudent individual behaviour of surviving members would be to hoard liquidity in order to safeguard their own stability (Morris and Shin (2008)). In other words, the surviving members can refuse to honour their cash calls (dashed arrow on right-hand panel). If they do so, this would deny resources to the CCP, threaten its recovery and, ultimately, destabilise the financial system as a whole. Even if surviving members do honour their commitments, some of them might have to resort to fire sales in order to access liquidity - thereby putting pressure on the broader derivatives markets and hence back on the CCP (Holden et al (2016)). Second, the CCP could resort to VMGH. In effect, this would allow the CCP to draw on any VM gains of the non-defaulted clearing members in order to cover losses (solid red arrow on right-hand panel). While VMGH eliminates the risk of non-performance by banks, it implies that certain derivative contracts will no longer hedge other risks that banks have taken on. This could threaten the viability of the non-defaulted banks. Regulators are well aware of potential feedback effects between banks and CCPs (eg CPMI-IOSCO (2018)). In fact, regulatory standards for CCPs and banks are set up to work with one another and to reinforce incentives to ensure financial stability. And agencies have considered various second-round effects (eg ESMA (2018)). However, given the complex web of incentives, spanning different institutions and markets, what might transpire under some stress scenarios is less than fully understood. This special feature has focused on the CCP-bank nexus, ie the two-way interactions between banks and CCPs. Arising from balance sheet interlinkages and the structure of the CCP default waterfall, these interactions can vary with the level of stress. Under some conditions, they might lead to a destabilising feedback loop with potentially system-wide effects. This puts a premium on the joint assessment of banks' and CCPs' risks in order to understand the endogenous build-up of risk. Even though our framework is stylised, it could help frame policy discussions. Admittedly, we have abstracted from potentially important institutional details, such as the CCP ownership structure or linkages stemming from the provision of credit lines by clearing members. That said, the framework incorporates key institutional characteristics and allows for an intuitive explanation of the often complex interactions between banks and CCPs. Aldasoro, I and T Ehlers (2018): "The credit default swap market: what a difference a decade makes", BIS Quarterly Review, June. BCBS-CPMI-IOSCO-FSB (2017): Analysis of central clearing interdependencies, July. --- (2018): Analysis of central clearing interdependencies, July. Bignon, V and G Vuillemey (2018): "The failure of a clearinghouse: empirical evidence", Review of Finance, forthcoming. Cecchetti, S, J Gyntelberg and M Hollanders (2009): "Central counterparties for over-the-counter derivatives", BIS Quarterly Review, September. Committee on Payment and Settlement Systems (CPSS) and International Organization of Securities Commissions (IOSCO) (2012): Principles for financial market infrastructures, April. Committee on Payments and Market Infrastructures (CPMI) and IOSCO (2017a): Recovery of financial market infrastructures - revised report, July. --- (2017b): Resilience of central counterparties (CCPs): further guidance on the PFMI, July. --- (2018): CPMI-ISOCO Framework for supervisory stress testing of central counterparties (CCPs), April. Commodity Futures Trading Commission (CFTC) (2016): "Supervisory stress test of clearinghouses", November. Cunliffe, J (2018): "Central clearing and resolution - learning some of the lessons of Lehman", speech at the FIA International Derivatives Expo 2018, London. Davison Report (1988): The report of the Securities Review Committee on the operation and regulation of the Hong Kong securities industry, May. Domanski, D, L Gambacorta and C Picillo (2015): "Central clearing: trends and current issues", BIS Quarterly Review, December, pp 59-76. Duffie, D and H Zhu (2011): "Does a central clearing counterparty reduce counterparty risk? ", Review of Asset Pricing Studies, vol 1, no 1. ESMA (2018): Report: EU-wide CCP stress test 2017, February. Financial Stability Board (FSB) (2014): Key attributes of effective resolution regimes for financial institutions, July. --- (2017): Guidance on central counterparty resolution and resolution planning, July. Freixas, X, J Rochet and B Parigi (2004): "The lender of last resort: A twenty-first century approach", Journal of the European Economic Association, vol 2, no 6, pp 1085-115. G20 (2009): "G20 leaders statement: the Pittsburgh summit", September. Holden, H, M Houllier and D Murphy (2016): "I want security: stylized facts about central counterparty collateral and its systemic context", Journal of Financial Market Infrastructures, vol 5, no 2, December. International Monetary Fund (IMF) (2010): "History of central counterparty failures and near-failures", in Global Financial Stability Report, box 3.5 April. Lowenstein, R (2000): When genius failed: the rise and fall of Long-Term Capital Management, Random House. Monnet, C (2010): "Let's make it clear: how central counterparties save(d) the day", Business Review, Federal Reserve Bank of Philadelphia, January. Morris, S and H S Shin (2008): "Financial regulation in a system context", Brookings Papers on Economic Activity, vol 2, pp 229-74. Murphy, D, M Vasios and N Vause (2014): "An investigation into the procyclicality of risk-based initial margin models", Bank of England Financial Stability Paper, no 29, May. Norman, P (2011): The risk controllers - central counterparty clearing in globalised financial markets, Wiley, May. Pirrong, C (2011): "The economics of central clearing: theory and practice", ISDA Discussion Papers Series, May. --- (2013): "A bill of goods: CCPs and systemic risk", in presentation at ECB-Bank of France-Bank of England Conference on OTC Derivatives Reform, Paris, September. Shin, H S (2010): Risk and liquidity, Clarendon Lectures in Finance, Oxford University Press. Wooldridge, P (2016): "Central clearing predominates in OTC interest rate derivatives markets", BIS Quarterly Review, December, p 22-4. 1 We thank Codruta Boar and Ann Neale for excellent research assistance, and Morten Bech, Frederic Boissay, Claudio Borio, Stijn Claessens, Benjamin Cohen, Luca Colantoni, Henry Holden, Amandeep Rehlon, Hyun Song Shin, Takeshi Shirakami, Nikola Tarashev, Philippe Troussard and Philip Wooldridge for their comments. The views expressed in this article are those of the authors and do not necessarily reflect those of the BIS. 2 Of course, the increased exposures of banks to CCPs have gone hand in hand with a drop in the direct exposures among banks in OTC derivatives markets. 3 The central clearing rate is not available directly from reported data, and therefore needs to be estimated. This is done using the share of notional amounts outstanding that dealers report against CCPs (solid lines in Graph 1, left-hand panel) and assumptions about the extent to which the reporting population includes the full set of participants. See Wooldridge (2016) and Aldasoro and Ehlers (2018) for details. 4 Given that some of the product markets are regional, the effective concentration of clearing in these markets is even higher. 5 In contrast, the default fund's replenishment is accounted for as an expense. 6 For simplicity we abstract from the factors behind the bank's payment default and how it relates to insolvency and resolution. These issues are beyond the scope of this article. 7 CPSS-IOSCO (2012) requires at least 99% of the estimated distribution of future exposures to be covered. Further guidance is provided in CPMI-IOSCO (2017b). Subject to regulatory minimums, CCPs can differ in terms of the specific parameters or methodologies they use for setting margins. IM is posted at the trade's inception, but the CCP can update IM requirements if the above three parameters change. 8 All CCPs are required at a minimum to cover the default of their largest clearing member (the so-called Cover 1 principle). This minimum is higher (ie covering a default of the largest two clearing members, the so-called Cover 2 principle) for CCPs that are involved in complex products and/or are systemically important in more than one jurisdiction (CPSS-IOSCO (2012)). There are no global standards on the required size of the CCP's SITG, although CPMI-IOSCO (2017b) provides guidance. 9 Market stress is most appropriately viewed as a continuum. In reality, a stress event can move from one scenario to another, and potentially cover all of the scenarios outlined. This categorisation into three scenarios, which differ in terms of the CCP loss-absorbing capacity involved, is a simplification. There could be alternative categorisations, for instance, centred on banks. 10 Global standards and national regulations tend to put limits on the margining discretion of CCPs. However, in practice some flexibility likely remains as excessively rigid margining rules might force inefficient bank resolution due to margin calls in times of stress. 12 Given the systemic nature of CCPs, recovery might be more realistic than resolution at this stage.